Is Your Beer Going To Be More Expensive? For decades, [the Justice Department] argue, Anheuser-Busch has been employing what game theorists call a “trigger strategy,” something like the beer equivalent of the Mutually Assured Destruction Doctrine. 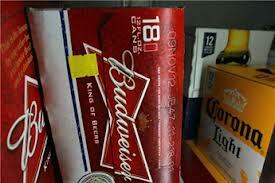 Anheuser-Busch signals to its competitors that if they lower their prices, it will start a vicious retail war. In 1988, Miller and Coors lowered prices on their flagship beers, which led Anheuser-Busch to slash the price of Bud and its other brands in key markets. At the time, August Busch III told Fortune, “We don’t want to start a blood bath, but whatever the competition wants to do, we’ll do.” Miller and Coors promptly abandoned their price cutting. Budweiser’s trigger strategy has been thwarted, though, by what game theorists call a “rogue player.” When Bud and Coors raise their prices, Grupo Modelo’s Corona does not. (As an imported beer, Corona is also considered to have a higher value.) And so, according to the Justice Department, AB InBev wants to buy Grupo Modelo not because it thinks the company makes great beer, or because it covets Corona’s 7 percent U.S. market share, but because owning Corona would allow AB InBev to raise prices across all of its brands. And if the company could raise prices by, say, 3 percent, it would earn around $1 billion more in profit every year. Imagine the possibilities. The Justice Department already has. Here is the Justice Department’s complaint. Davidson says they use game theory models to forecast the impact of the merger. But I do not see that in the complaint. Is there a publicly available document outlining their analysis? I’m sure all these large scale beer manufacturers are strategically sophisticated. Minimum efficient scale in beer making is quite small [even in America]. Free entry; who cares? Minimum efficient scale in *distribution*? Does this assume some barriers to entry?? Otherwise I’m not sure what prevents a new entrant from upsetting the kind of implied collusion.